Have you ever heard someone say “sour makes you smile”?. That’s what we say here in Germany when we eat something sour because it makes your face look funny. If you’ve ever tried eating pure red currants, you might have noticed that they taste a bit sour. Actually, despite their sour flavor, they’re really quite healthy, because they contain a lot of vitamin c and antioxidants. 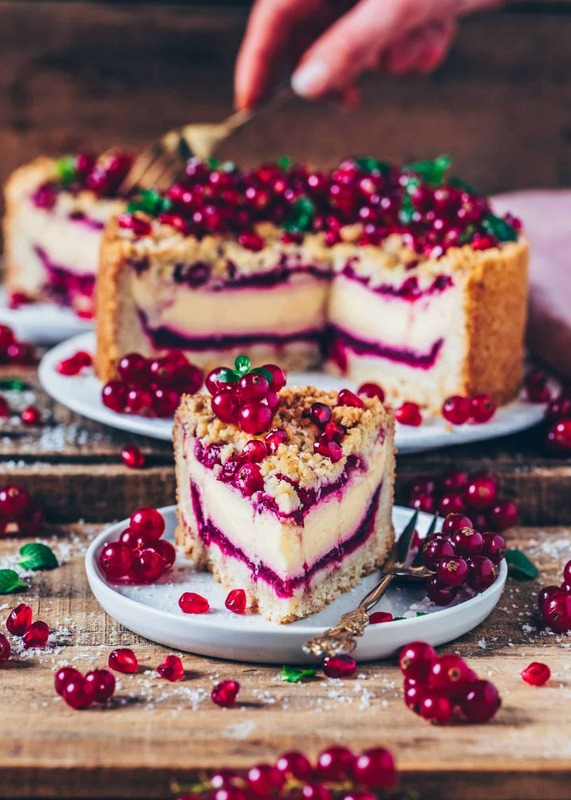 This Red Currant Cheesecake with Streusel is a great way to enjoy currants in a delicious way. They complement the sweet Cheesecake with crumbly Streusel perfectly! 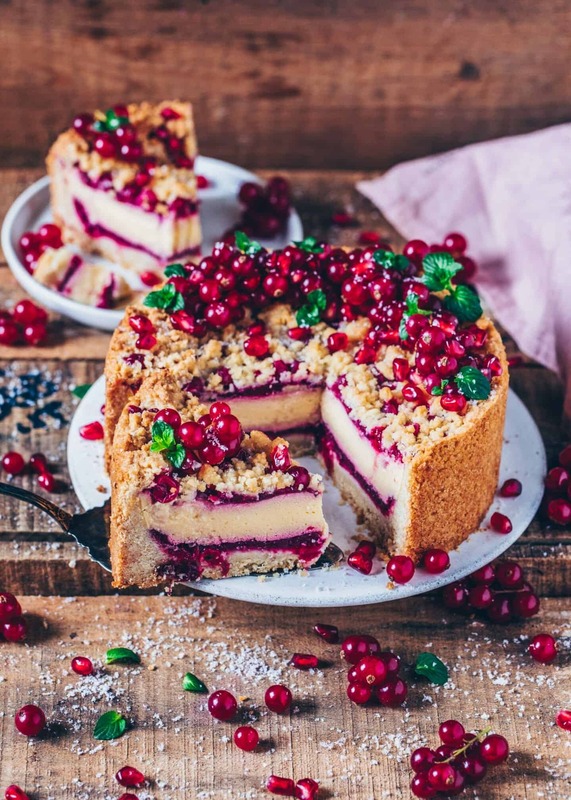 The sour taste is a great addition, taking this Crumble Cake to the next level! If you’re not a big fan of these little sour red currants, don’t worry, because you can add any berries you like. 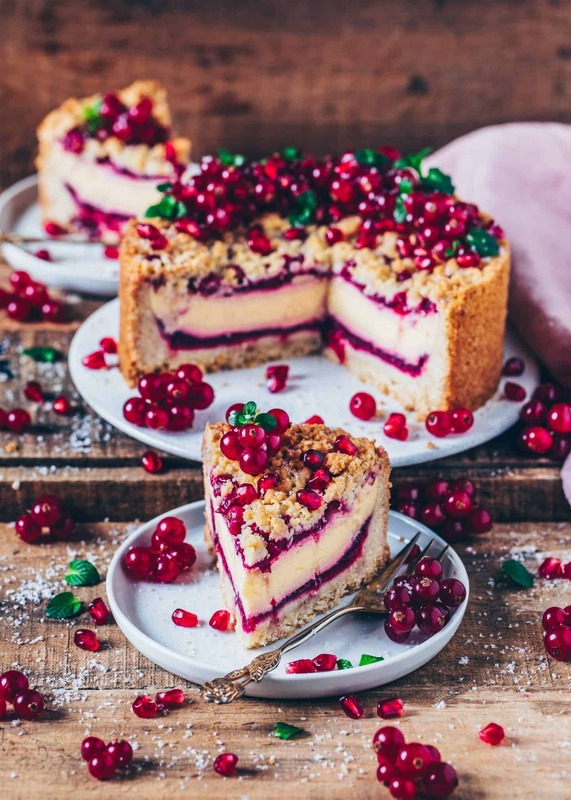 Instead of making a Red Currant Cheesecake with Streusel, you can also turn this recipe into a Raspberry Streusel Cheesecake or a Blueberry Streusel Cheesecake. 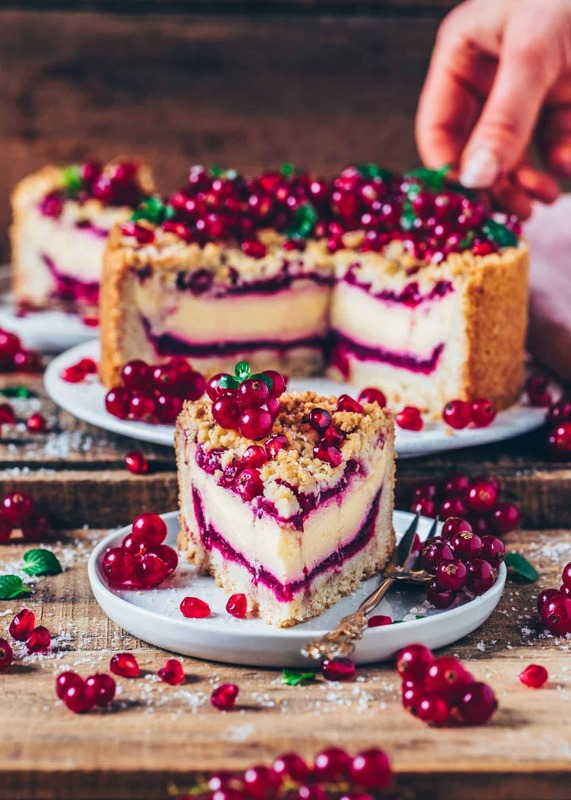 Another great thing about it is that if you don’t have fresh berries on hand, you can also use frozen berries, or mix and match different kinds of berries if you prefer. Feel free to get creative! The crust and topping for this Crumble Cake are both made in one bowl, which means less work for you, and less dirty dishes to clean. Usually, you need two doughs to make a Crumble Cake, however, I prefer keeping it simple. 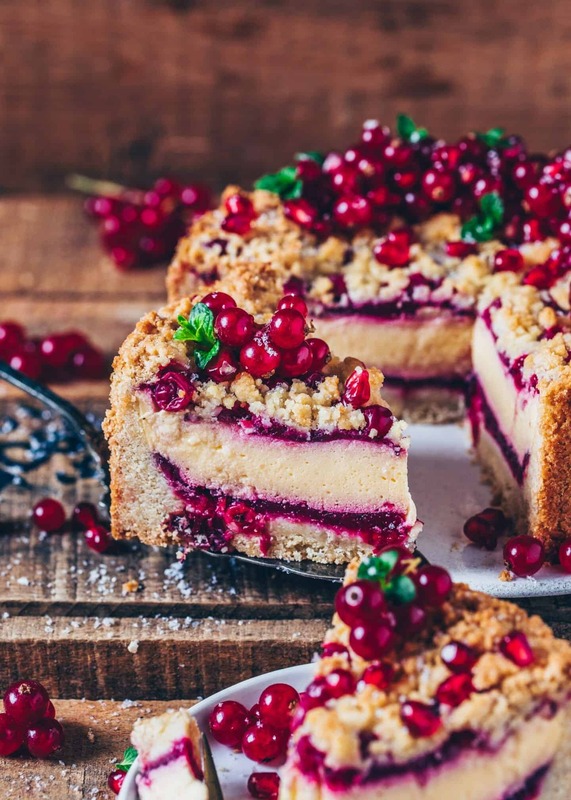 When you mix the ingredients for this Crumble Cake dough, you’ll get soft Streusel which you can also press in your springform pan to form the crust. 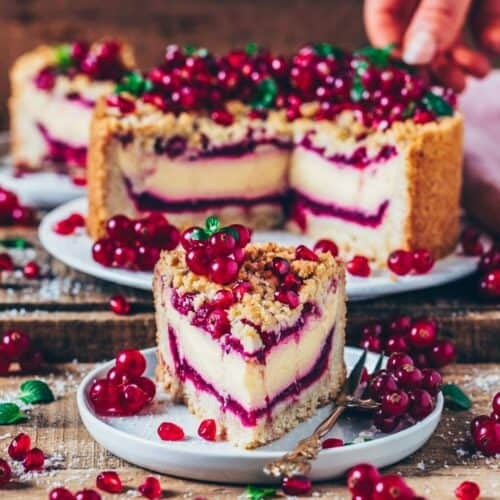 Simply use 2/3 of the crumbly dough for the crust and later sprinkle the remaining 1/3 of the dough as streusel on top of your Red Currant Cheesecake. That’s it! 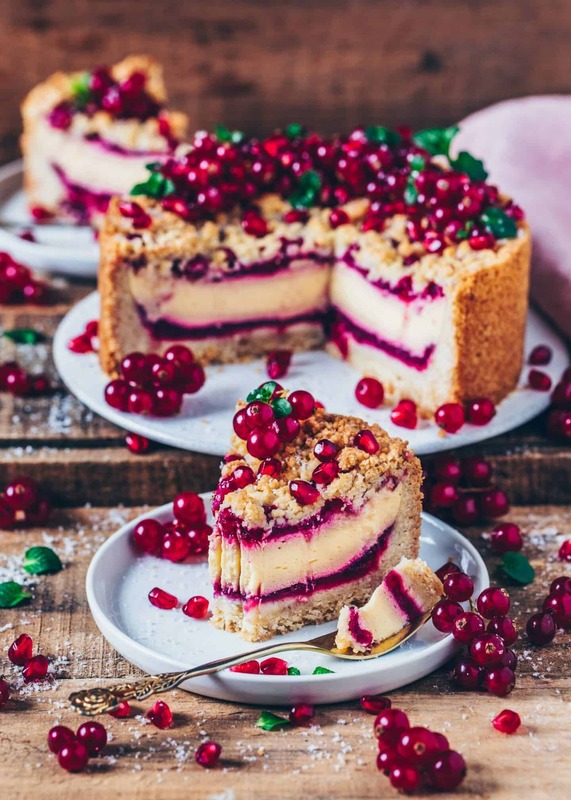 It’s not only the Crumble Cake but also the Vegan Cheesecake layer that is made in a couple of minutes. It consists of just a few simple ingredients, such as cornstarch, vegan butter (plant-based Margarine or coconut oil will do too) and drained dairy-free yogurt which is known as “quark” or cottage cheese. You can easily make quark yourself by filling dairy-free yogurt in a strainer lined with a cloth and let drain for 12 hours. If using 17,6 oz (500 g) yogurt, it should make about 12 oz (340 g) quark. Otherwise, you could also substitute with a combination of dairy-free cream cheese or firm tofu with regular dairy-free yogurt or silken tofu. The texture shouldn’t be too firm, but also not too liquid. If you’re not vegan, however, you can use regular dairy products. 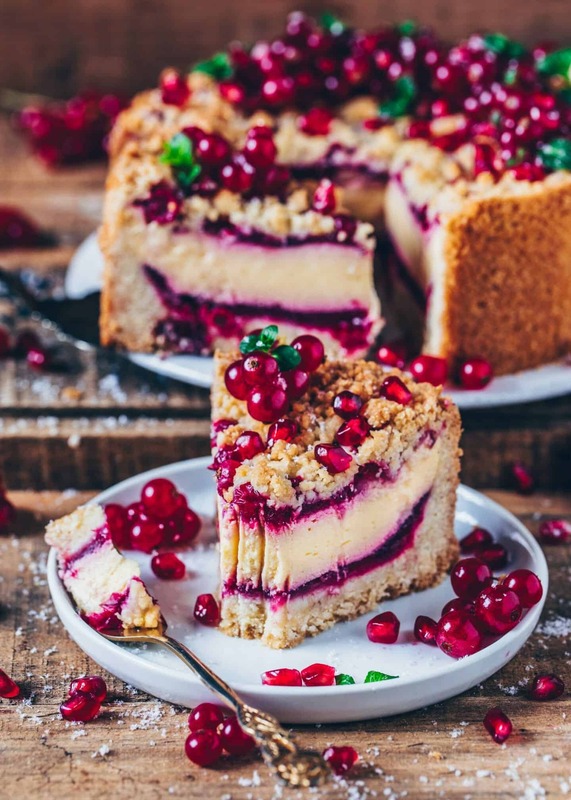 Vegan Cheesecake with Streusel – The perfect combo! This is not the first time I’ve added a vegan Cheesecake filling to a Crumble Cake. I really love this yummy combination! 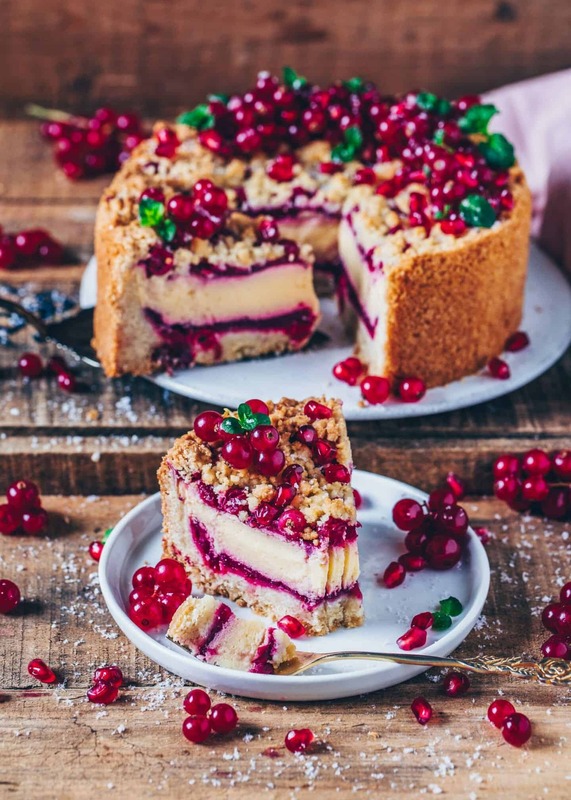 I mean, who could ever say no to a juicy and creamy Red Currant Cheesecake inside a Crumble Cake with crunchy Streusel on top? 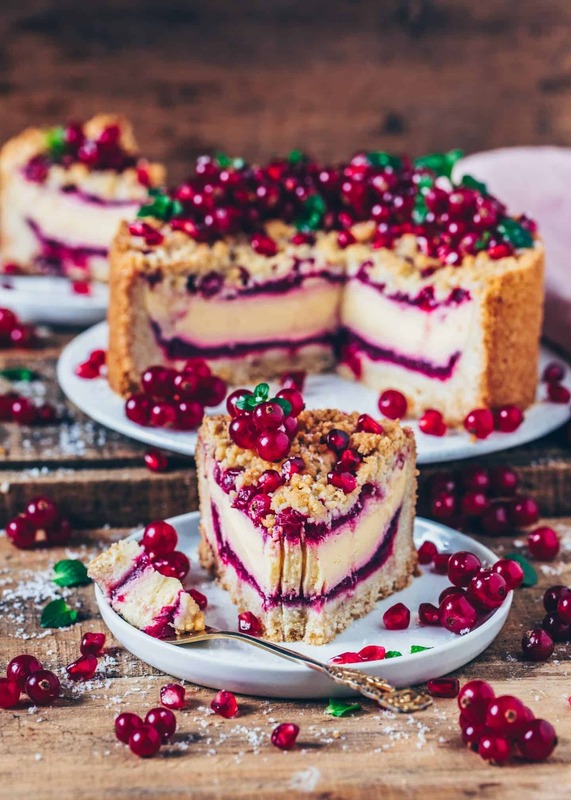 To me, a vegan Crumble Cake Berry Cheesecake is the best cake ever! Also great as Birthday Cake or for any other occasions! 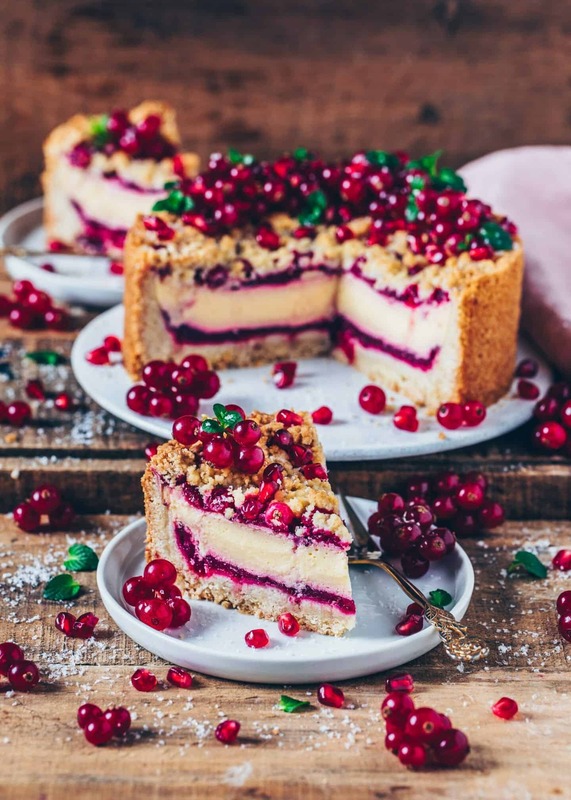 If you’re looking for more similar Vegan Cake recipes to enjoy with your afternoon cup of coffee or tea, you could check out my Blueberry Crumble Cheesecake, or my Cheese Crumble Berry Cake, or my Cranberry Crumb Cake. Just in case you‘re in the mood for making a chocolate crust, you could head over my Vegan Cheesecake with Chocolate Crust. Melt the vegan butter in a pot slowly and allow to cool slightly. Sift the flour in a bowl. Add baking powder, salt, vanilla and sugar and mix to combine. Add the soft vegan butter and mix everything with an electric hand mixer (first at low speed, then at medium speed), until crumbly. (The longer you mix, the bigger crumbles you‘ll get). Add 2/3 of the crumbly dough to a greased 7/8-Inch (18/20cm) springform pan and press the dough at the bottom and sides to create a crust. Bake the crust for 10 minutes, then remove. Stir the cornstarch and 3 tbsp of the juice until smooth. Add the remaining nectar in a pot and bring to a boil. Stir in the cornstarch mixture along with 1,5 tbsp sugar and bring to the boil again while stirring. Simmer for 1 minute, stir in the red currants, then allow to cool for about 10 minutes. (The compote should be fairly thick). Spread 2/3 of red currant compote on the pre-baked crust evenly. Melt the vegan butter slowly and allow to cool slightly. Put the soy quark, plant-based milk, sugar, vanilla pudding powder (or cornstarch mixture) and soy flour in a mixing bowl and mix with an electric hand mixer until creamy. Then stir in the vegan butter and a squeeze of lemon juice. Fill the cheesecake mixture over the compote and smooth out evenly. Combine the rest of the compote with the remaining red currants and, carefully, spread over the cheesecake layer. (If the compote became too firm in the meantime, you can re-heat it a bit, so it gets more liquid which makes it easier to spread). Also, sprinkle over the remaining Crumble Cake dough as Streusel. Bake the cake for about 50 minutes, or until a toothpick comes out almost clean. (Take a note that the cake becomes also firmer when cooled). Let the cake cool completely and preferably refrigerate at least 1-2 hours (or overnight). You can use any berries instead of red currants. Also, frozen berries are fine. To make this cake gluten-free, you can use a gluten-free flour blend instead of all-purpose flour or spelt flour. To make this cake sugar-free you can use a sugar substitute instead of regular sugar. If you do not find any dairy-free quark in the supermarket, you can make it yourself. Simply fill about 17,6 oz (500 g) of dairy-free yogurt in a strainer lined with a cloth and let drain for 12 hours. That should make approx. 12 oz (340 g) of quark. Otherwise, you could also use dairy-free cream cheese or tofu. If you're not vegan, you can also use regular dairy products, of course. You can also use flavored soy quark or yogurt (I personally like Vanilla soy quark). If it’s already sweetened you could add less extra sugar into the Cheesecake batter. If the cake gets too dark on the surface while baking, simply cover it with a piece of baking paper or aluminum foil. 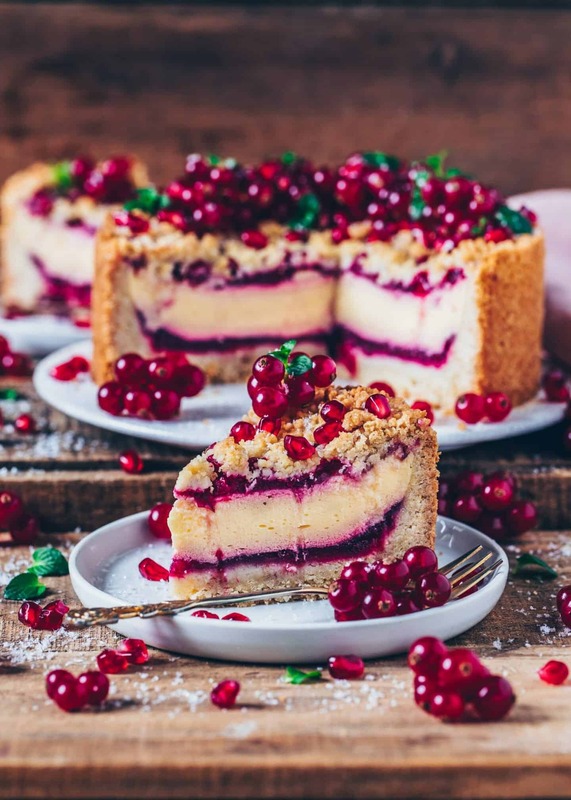 I do love red currants, they must be balancing out the sweet flavour of this superb cheesecake really well! Wish I’ve had a big slice of it now Bianca! About how many servinds would you say this recipe makes? 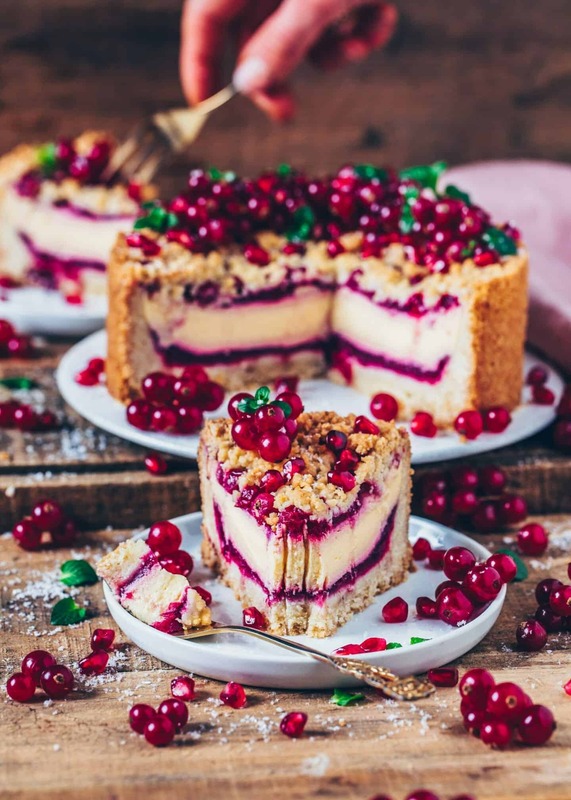 This is the most beautiful cheesecake I have ever seen!